We are a volunteer nonprofit organization and community partner in the Canada Revenue Agency (CRA) Community Volunteer Income Tax Program (CVITP). Each year, along with some 3,000 similar partners across Canada and 16,000 volunteers, over 500 thousand income tax returns are prepared for seniors, low income, physically challenged and new Canadian citizens. 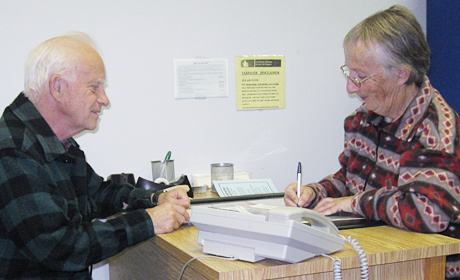 Pensioners Concerned has been doing returns for over 40 years and for the 2010 tax year we completed close to 1,500 returns for tax payers in Belleville and the Quinte area. We provide assistance in completing Old Age Security (OAS) and Guaranteed Income Supplement (GIS) forms when people reach the age of 65. We also prepare other government forms as needed and assist clients in resolving issues relating to questions resulting from their CRA Notices of Assessment. During a tax season our office is typically open from around February 27th to April 30th between 9 a.m. to 3 p.m. Mondays to Fridays, excluding public holidays. We operate on a first come, first served basis and do not make appointments. If a client is unable to wait to have their return completed, the information can be left with the receptionist and a tax preparer will complete the return as soon as possible. The client will then be called to pick it up. To leave a return, all information must be complete including all tax slips, medical and donation receipts and rent and property tax information along with the prior years’ return if available. We also offer a home visit program for shut-ins as well as a nursing home visit program where we spend one day preparing returns at each nursing or retirement home in the city that requests this service. We are approved by CRA to electronically file (e-file) client’s returns. This service is available for the current tax year only, usually until the end of September. Prior years’ returns cannot be e-filed. We do not charge fees for our services but we do accept donations. All donations received, except for a nominal amount to cover our operating expenses, are given back to the community to help organizations who assist seniors and low income people.